"To be sure, she was something of a slug, and a ramshackle old slug, when Tom Andrews had her. But the Dockyard has taken her in hand ... and now she is the finest fifty-gun ship afloat, not excepting Grampus. Certainly the finest fourth-rate in the service!" 1811 - 1812: Although prospects for Jack's career looked bright at the end of the previous novel in the series, nothing in the way of a command - except for a land posting to the Sea Fencibles - materializes until in Desolation Island he is offered HMS Leopard, a 50-gun Fourth Rate ship, for a voyage to Australia. Jack gives up command of the Leopard at the start of the next novel, The Fortune of War, in order to return to England. O'Brian used a genuine Royal Navy ship of the Portland class for his setting, but the experiences of the Leopard presented in this novel were not taken from history; the near loss of the ship after an encounter with an iceberg never happened to the actual vessel. By the era depicted in Patrick O'Brian's novels, 50-gun ships were becoming a rarity. The Leopard was converted to a troopship in 1811 and was wrecked in fog in the Gulf of St. Lawrence in 1814. "A trim little ship, a frigate in miniature, but with a purer unbroken line; a formidable little ship too, with her sixteen thirty-two pounder carronades and her two long nines." 1813: In The Fortune of War Jack Aubrey is captured by the Americans (the War of 1812 has started in his absence) while a passenger aboard another ship during his return, but he eventually escapes from Boston to the blockading Royal Navy Shannon in mid-1813. After his return to England, as described in The Surgeon's Mate, Jack is given command of a vessel normally considered too small for a post captain: the 16-gun ship-sloop HMS Ariel, which is rated as a post ship for a special mission in the Baltic. After completing the mission, the Ariel is wrecked on the coast of France, with Jack imprisoned before his eventual escape. The Royal Navy had a genuine sloop Ariel. Although in The Surgeon's Mate the Ariel is described as being a French-built prize, the actual sloop came out of an English yard, part of the Royal Navy's Merlin class. In appearance, she did indeed appear to be "a frigate in miniature" as described in O'Brian's novel. She was sold out of the service in 1816. Patrick O'Brian adopted a flexible attitude towards the timing of actual historical events while reflecting them in his novels. In general, his fictional world paralleled reality (with some exceptions) from Master and Commander up through The Fortune of War and even into The Surgeon's Mate. The Fortune of War presents two "real world" events from late-1812 and mid-1813: the capture of HMS Java by the USS Constitution and the capture of the USS Chesapeake by HMS Shannon. Jack's return to England early in The Surgeon's Mate also fits reasonably into a mid-1813 timeframe, but Patrick O'Brian as an author of a continuing series of novels faced a lack of historical time for future adventures. The Napoleonic Wars would cease in 1814 (to be followed by a brief re-emergence of Napoleon in 1815) and the American War would end in 1815, shrinking the stage for possible heroic action. Therefore, O'Brian introduced into his novels a world without reference to outside time - no particular years were to be specified, no events specific to a given year would be described. For novel after novel, everything seemed to be happening in an endless year of 1813, carrying the series from The Surgeon's Mate all the way across the next ten novels and into The Yellow Admiral before real world chronology is reintroduced. In this literary Long Year of 1813, however, the characters in the series age in general conformance to the time period over which O'Brian wrote his books. "... one of the surviving Forty Thieves, that notorious set of line-of-battle ships built by contract with a degree of dishonesty in their scantlings, knees, fastenings - in their whole construction - that excited comment even in a time of widespread corruption." 1813: In The Ionian Mission Jack Aubrey is in the Mediterranean in command of HMS Worcester, a 74-gun ship-of-the-line. The Worcester is described in the novel as being of the notorious "Forty Thieves" type (a designation bestowed for their poor workmanship, although the name actually dates from after the close of the Napoleonic Wars, as the fortieth ship was not completed until long after the fighting ended), more formally known as the "Surveyors' class" that began with the launch of HMS Armada in 1810, contrary to the impression given in the novel that the Worcester is an old ship. Although the ship class is genuine, the specific name "Worcester" is fictional. The poor reputation of this group of Third Rates was probably not entirely deserved, and in fact the design produced more ships-of-the-line than another other class. The Armada herself was not sold out of the service until 1863. The data below are for HMS Armada (Winfield 80). The plans are those for HMS Blake of a similar class of Third Rate ships-of-the-line, with the plans slightly altered to reflect the length and breadth differences. Armament: Gun Deck twenty-eight 32-pound long guns, Upper Deck twenty-eight 18-pound long guns, Quarterdeck four 12-pound long guns and ten 32-pound carronades, Forecastle two 12-pound long guns and two 32-pound carronades. 1813: Due to the poor physical condition of the Worcester, Jack transfers to his old favorite HMS Surprise for further operations in the eastern Mediterranean, a situation continuing on into Treason's Harbour. "The Niobe spread her wings, the water began to sing down her side again as she leant to the thrust of the not inconsiderable remaining wind, and with the tide helping she ran quite fast through the islands and into the open sea, a pretty sight with her topgallants and studdingsails aloft and alow." The Niobe is a fictional vessel, although the East India Company's Bombay Marine did include ship-sloops. She probably would have in general resembled a Royal Navy sloop of the Osprey class. Armament: Two 6-pound longs guns and sixteen 32-pound carronades. 1813: Jack Aubrey returns from the Red Sea to the Surprise in the Mediterranean. 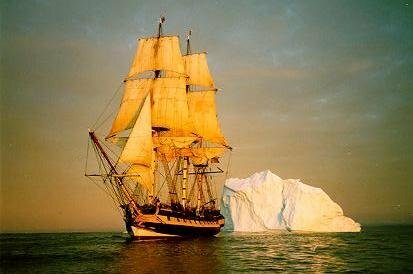 At the beginning of The Far Side of the World he is to sail her to England where the ship is to be sold out of the service, but the Surprise is given a reprieve when Jack is suddenly ordered to the South Atlantic to intercept an American frigate and, if not successful, to follow her into the Pacific. Surprise indeed rounds Cape Horn in pursuit of the American, eventually returning to the Atlantic and England in The Reverse of the Medal. Ensnared in a Stock Exchange fraud, Aubrey is dismissed from the Navy, while at the same time the Surprise is sold out of the service, bought by Stephen Maturin for use as a private man of war with Jack Aubrey as its commander. Jack in the Surprise operates in Atlantic and Baltic in The Letter of Marque. At the beginning of The Thirteen-Gun Salute, he departs England en route to the Pacific coast of South America on a secret mission for the Admiralty.